A litre of fuel now sells for N250 in most filling stations owned by the independent petroleum product marketers in Enugu and environs. According to a (NAN) correspondent who visited the filling stations in the city on Sunday observed that the product was sold for N250 per litre. It was however observed that the product was available in abundance in the filling stations though sold above the government regulated price of N145 per liter. Reports gathered that the product was still sold for the official price of N145 a litre in Total, Oando and NNPC filling stations as well as the filling stations of other major marketers. 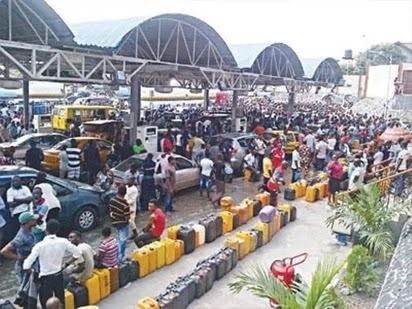 The Manager of one of the independent marketers’ filling stations in New Layout, Mr Chidi Ugwu, said the increase in price was due to the recent difficulty in getting the product from the Port Harcourt depot. “When the supply at the Port Harcourt depot normalises, the price will gradually return to normal,’’ Ugwu assured. The situation has led to increase in transport fare in the city as taxis now take N80 for a drop instead of N50. Mr Obinna Nnadi, a commercial bus driver in Agbani Road, decried the situation, saying that the independent petroleum products marketers had subjected Nigerians to unnecessary hardship. “Government agencies concerned must stand up against this yearly exploitation since it is clear that this is man-made and artificial scarcity,’’ Nnadi said. A resident of Achara Layout, Mr Linus Obidike, said that the development had made it impossible for those with relatively large families to travel to their villages to celebrate Christmas. “It is already telling on transporters as they are currently witnessing gloomy business this season. “As I speak to you, I should have travelled but I have shelved it due to the high cost of transportation,’’ Obidike said.